Were years of hype about the new 787-8 Dreamliner justified or squashed with our first hop aboard United Airlines version of the plane? 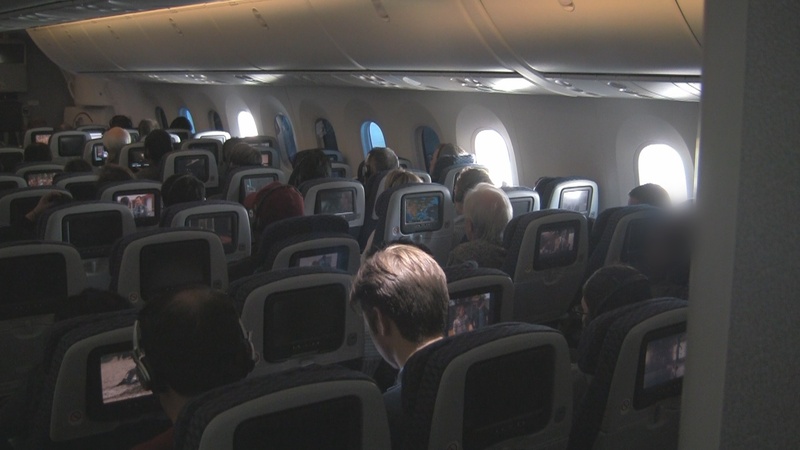 If our Economy Plus seat review didn’t reveal enough, then watch as we tour more of this shiny new aircraft. Airplane geeks don’t typically keep their cool when boarding a brand new aircraft so it’s no surprise that I was tripping over other passengers past this United 787-8 Dreamliner Business First cabin trying to get pictures on the way to my seat. When I finally took a moment to stop and just look around I realized this was just another plane to the naked eye. 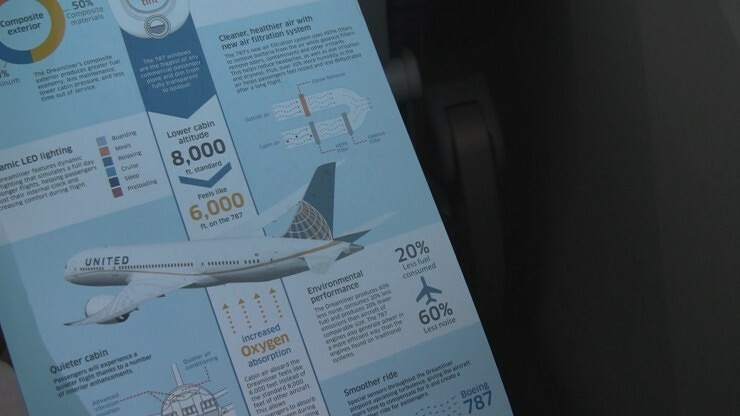 What’s special about the plane is the technology behind it designed to deliver things like better cabin air, a smoother ride and a great view outside. 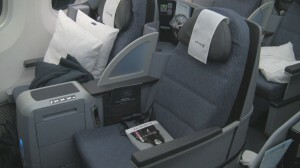 The on-board perks come mainly from Boeing (the plane’s manufacturer). 3-3-3 seat configuration in economy & economy plus (3 on each window, 3 middle). Leaves you with pretty narrow seats. In this version of the Dreamliner United really packs you in. Good legroom in Economy Plus but the upgrade is likely to be lost on you if you’re under 6′. Seat width is badly lacking. Personal TV is loaded with a good number of movies, tv programming and audio. Missing (at least on this flight) was the “From The Flight Deck” cockpit channel, our favorite. Power outlets both standard and USB are nice to have but it takes an awkward moment with whoever’s in the middle seat to get at the 110v port. You’ll feel refreshed upon arrival thanks to better oxygen absorption and LED lighting that’s supposed simulate a full day on long flights. This, I’m told, is supposed to help keep your Circadian rhythm in-check. Okay. You’ll feel less turbulence. Sensors built into the 787 predict turbulence ahead allowing the plane to make adjustments ahead of time. You’ll hear less engine noise. Advances to the design of the passenger cabin and engines isolate you from the noise. I’m hoping for advances in quieting extra-chatty neighbors. Your carry-on can be carried-on. More overhead bins mean more room for your rollers and backpacks. Hopefully that means no more having to put your bag over row 36 when you’re seated in row 18. Summary: We’ve shown little love for United in recent months, but those are mainly service issues. What’s disappointing here is that there was no effort to at least make this plane look or feel any different than a 777 , A330 or two 737’s duct-taped together. If United had taken the opportunity to design something mildly extravagant (eg. walk-up bar) for their United 787 Business First passengers or maybe have gone with an economy configuration that would have allowed for even slightly wider seats THEN I’d be a little impressed. United’s version of the Dreamliner looks and feels more like a “Bottomliner”…Get it? This won’t be the first Dreamliner United flies though, the 787-9 begins service in late 2014. We do like the Business First seats here and look forward to lying-flat in one soon. I have a feeling of dread over the idea of spending a long trip in the back of that plane. Not for me!